Senator Dino Melaye has been moved from the Police Clinic in Area 1, Garki in Abuja to one of the government’s medical facilities. He has been under custody under a 14 day detention warrant obtained from the FCT High court by the police on 9 January. Police confirmed that the senator who has spent some days in police hospital was on Friday moved to government hospital. The full statement issued by Mr. Jimoh Moshood, Force PRO is hereunder reproduced. 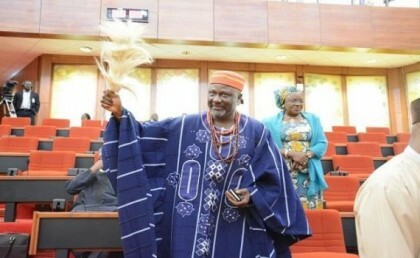 “Senator Dino Melaye under investigation and currently in Police custody on a fourteen (14) day remand warrant obtained from the Federal Capital Territory (FCT) High Court on 9th January, 2019, for the offence of criminal conspiracy and attempted culpable homicide, committed on 19th July, 2018, when Senator Dino Melaye and his armed thugs attacked Police personnel, shot and wounded SGT Danjuma Saliu on stop and search duty along Aiyetoro Gbede, Mopa Road in Kogi State, has been taken to another Government hospital for further medical attention. Senator Dino Melaye was taken for medical attention at the Police Clinic, Abuja, after he surrendered himself for arrest on 4th January, 2019. The Police medical team at the Police Hospital, Abuja certified that Senator Dino Melaye is well and healthy to stand trial after treating him. However, due to the complaint from Senator Dino Melaye that he is not well, the Police Investigation Team has taken him this afternoon to another government hospital, DSS Medical Facility in Abuja for further medical attention. The Police Investigation Team obtained a Fourteen (14) day Remand Warrant from the Federal Capital Territory (FCT) High Court on 9th January, 2019, to keep Senator Dino Melaye in Police Custody for investigation into the case of criminal conspiracy and attempted culpable homicide against him till 23rd January, 2019. It is incorrect as reported in some sections of the media that Senator Dino Melaye was moved by masked armed policemen to an undisclosed location and that his where about is unknown. Senator Dino Melaye will be prosecuted along with other suspects on completion of investigation.